As I was cleaning up my room the other week, I came across a paper I wrote for a psychology class way back in 2001. The subject was Thomas Harris’ Hannibal Lecter. This piece also gives you an idea of my writing style almost 10 years ago. 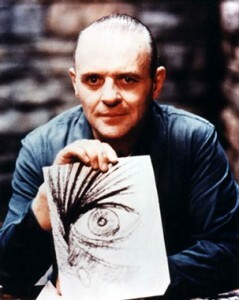 Hannibal Lecter VIII portrayed by Sir Philip Anthony Hopkins in 1991, 2001, and 2002. The ever-sibilant Francis Dolarhyde referred to himself as Him (The Dragon and erroneously the Tooth Fairy as well) during the course of Red Dragon. An awakening, not only for Gateway’s production supervisor but also for Dr. Hannibal Lecter—the “supporting/supporting” character in the book. 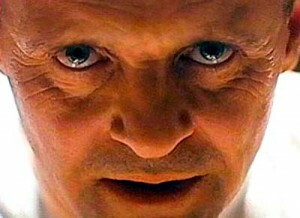 Lecter, described as a small and sleek gentlemen of 41, was often poised with the grace of a dancer and though his role was somewhat “supportive” in the novel…many (“avid fans”) could see his potential to be something bigger…something larger…with the shear ability to transcend the confines of non-fiction itself. 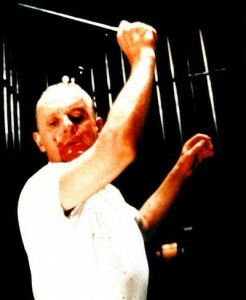 Lecter escapes by killing his guards and eviscerating them. By what went through his mind when he was not doing any of these things? Times when his personal belongings were taken from him because he stepped out of the acceptable norm. A single thing stood out from my readings—his incredible sense perception. Dr. Lecter could smell a freshly placed band-aid on an individual who stood several feet away from him…he would conceptualize what he could not visualize in his mind—literally reconstructing it as if it’s presence were before him. Finally, the ability to perceive deceit—he could see that one coming a mile away. Incarceration has its advantages as it allows you to explore your other interests.